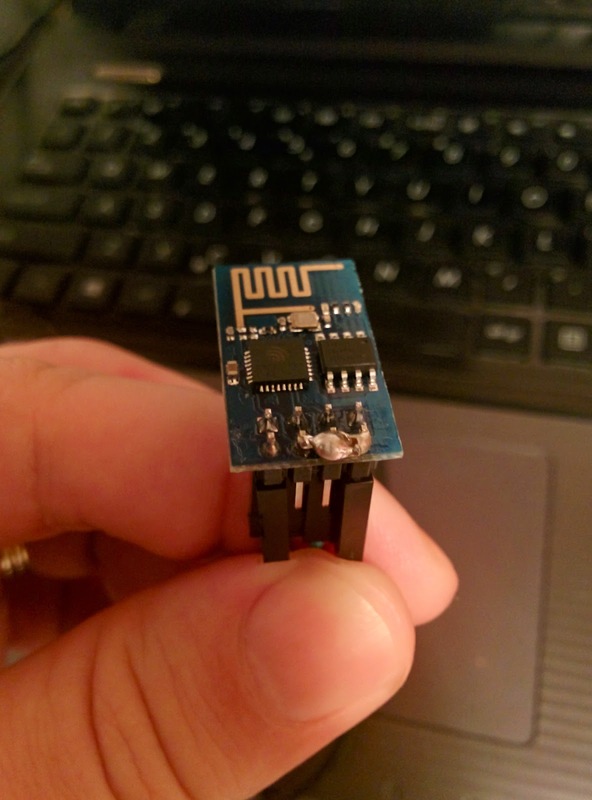 One of the popular boards with ESP8266 is ESP-01. It is not so friendly with your breadboard ( not at all in fact) but if you have the same DuPont wires is fine. If you look in the first picture you will see that I've connected CH_PD and RST pins to VCC ( I know that it is not looking very good, but it works for now). UTXD, URXD and one GND will be connected to your USB to Serial adapter and to write some code into the flash GPIO0 will be connected to GND during power up ( but this later in other posts). After the code is loaded the GPIO0 and GPIO2 can be used to connect a temperature/humidity sensor on GPIO2 for example and an relay on GPIO0. Or a PIR on GPIO0 and an relay for a lamp on GPIO2. By default the board is coming with a software that allows using AT command to configure it and same basic functionality. Personally I overwrote the manufacture code with my own.